Next to color, it's the infinite variations of dahlias that make them such a perfect choice as the featured flowers or floral addition to any bride's wedding flowers and decorations. 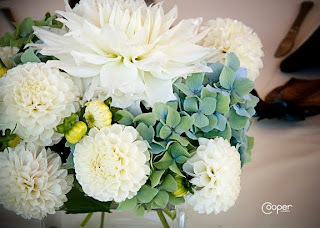 Petite to preposterous, cool white and pastel to fiery brilliance, dahlias can do it. Lynch Creek Floral owner and designer Colleen Hunter says one of the things she loves about dahlias is the range of sizes. 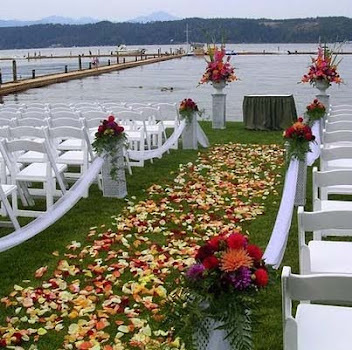 She can choose little round pom pon dahlias or mignon singles for flower girls and, within the same species and color ranges, mid-size dahlias for personal bouquets or reception tables and striking dahlias big enough for massive floral baskets or free-standing bouquets that will hold their own outdoors or in a cathedral. Whether you're growing your own and making your own bouquets, buying farm-raised dahlias to augment florist's flowers, or working with a florist for the whole shebang, dahlias offer a lot of decoration for the dollar, and colors and forms to meet every taste. Starting this time of year, you can buy or grow dahlias in types small enough for boutonnieres or nosegays and bold dinner-plate dahlias for pillar arrangements to be seen at a distance. You can grow or select dahlias for personal flowers, the bride's bouquet, and church or hall and table arrangements, and you can plant dahlia tubers to have colorful, elegant dahlias in pots at your wedding or reception site or in flower beds where you plan an outdoor wedding or wedding gathering. The range of forms is as impressive as the range of sizes. For interesting forms at a distance, there are cactus dahlias, with their slender rolled florets like an explosion of fireworks, and laciniated dahlias whose florets have split tips. Round, tightly flowered pom pon and ball dahlias make romantic bouquets, waterlily dahlias look classic in any setting, and mignon single, orchid and colarette dahlias offer a delicate look for a tiny bouquet or arrangement. And because of their good substance and holding power, dahlias will do great things for wedding settings. They can decorate elegant wedding cakes, stand up to a small flower girl's hot-handed clutch, crown floral archways with brilliant color on a hot day, and provide petals for strewing in the bride's path. For your August or September wedding, dahlias are the ideal wedding flowers. Hello! 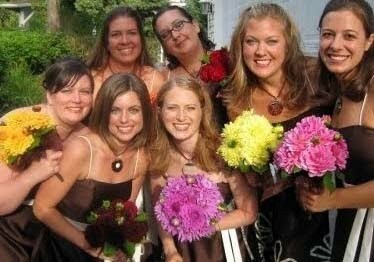 Would you happen to know what type of Dahlia is positioned at the top of the bouquet in the 3rd picture? I have googled each type of dahlia you've mentioned, but the pictures that I've found don't exactly match the petals in that bouquet. Thanks so much! Hi Christina, The mystery Dahlia is "Carl Chilson". It just happens to be positioned in a way that makes identification tricky! Thanks for reading. 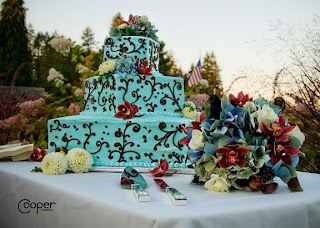 I love the color scheme in the pic with cake. Very unique. Dahlias are my favorite!